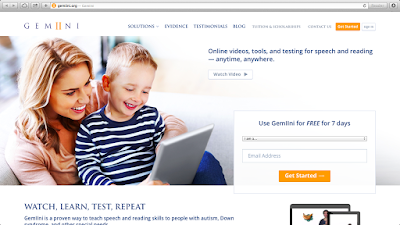 Exceptional Child makes special education training easier and more accessible for school districts, individual educators and parents by delivering the very best resources, from expert thought leaders, available through any Web-enabled computer or device. When the right training and resources are available to the dedicated adults who support students with special needs, the lives of these children can be greatly improved. For more information about the Exceptional Child System, contact Scenario Learning at 1.800.434.0154 or visit http://www.exceptionalchild.com/. Storyline Online (http://www.storylineonline.net/) is appealing for several reasons. First, the layout of the website is very eye-catching. This invites you to explore the website a little more. The visuals and audio are wonderful. Secondly, each book is read aloud. You will love how simple the website is. Information does not overwhelm the website. The home page of Storyline Online is full of vibrant, inviting colors. Each book is large enough to see the details of the covers and there are sound effects if you scroll over each book. When you click on the book, it leads you to a video of the Read-Aloud. The video is a good size for the website. It is not too large or too small. Each video is read aloud by a celebrity. The length of the Read-Aloud is given as well as a short synopsis of the book. Each book is beautifully read. Images from the book are shown in the video. The simplicity of the website is wonderful. It is very easy to navigate and there are not many words to overwhelm the website. There are no advertisements on the corners to distract from it and all the links work well. Although the amount of books offered is limited, they have popular titles such as The Rainbow Fish, Stellaluna, Harry the Dirty Dog, and Knots on a Counting Rope. There are only twenty-four total books available on the website. Hopefully, a larger variety of books will be provided later on the website. Storyline Online is a resourceful website for parents, students, or other teachers. Experiencing Read-Alouds is very important when developing literacy skills in children. Some children may not be exposed to this when they begin to read. This website affords children this experience. It is very colorful and may attract the attention of young children simply because of its aesthetic appeal. Videos are attached to each book so that the children may have a better Read-Aloud experience. The ALLIANCE National Parent Technical Assistance Center (NPTAC) provides Parent Centers, Parent Training and Information Centers (PTIs) and Community Parent Resource Centers (CPRCs), with innovative technical assistance, up-to-date information, and high quality resources and materials. Family Voices of California (FVCA) is a statewide collaborative of locally-based parent run centers working to ensure quality health care for children and youth with special health care needs. IMPACT is a California statewide all-volunteer, non-profit organization of parents, teachers and professionals serving deaf and hard-of-hearing children. Established in 1986 by 12 parents, IMPACT has a current membership of over 300 and is supported and encouraged by a host of organizations that serve the deaf community. Hands & Voices is a nationwide non-profit organization dedicated to supporting families and their children who are deaf or hard of hearing, as well as the professionals who serve them. The American Society for Deaf Children supports and educates families of deaf and hard of hearing children and advocates for high quality programs and services. Click here to return to the GICC Parent Network Home Page.